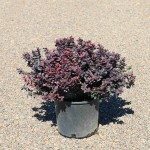 A dense, slow growing low shrub with dark burgundy foliage. Has small yellow flowers in the spring, but will set no viable seed. The fall color is a bright scarlet. 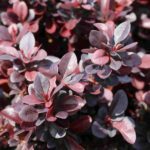 It was selected for it's compact form, making it great for mass planting or a low hedge. It is drought tolerant once established.